This method also works for purchases through PayPal or MyCommerce, where the discount amount will be 10% lower than the discount for purchase through bank for the same purchase size. ***Exception: UK and EU countries. If you’re from one of these countries, choose another program or contact us for big purchases. – 20% discount for any purchase of Xeoma Cloud through bank transfer or with credit cards, or 10% for purchases of Xeoma Cloud through PayPal/MyCommerce. – 10% discount for any purchase of Xeoma Repeater. Only available for payments through bank transfer or with credit cards. Contact us to get an invoice with discount or if you want to use another payment system to pay prepayment. https://shopper.mycommerce.com/checkout/cart/add/14338-1?affiliate=XXXX to purchase 1 license for WebCam Looker. At the end of the billing period you can get 20% commission of all purchases from MyCommerce. If you can’t find a license for the right number of cameras in the list, you can purchase several licenses that would provide the the right number in total (e.g. 64 cameras + 16 cameras make 80 cameras). You don’t need registration at FelenaSoft if you use this method but we would be always glad to hear from you and get your feedback, suggestions, ideas on how to improve conditions for resellers. *equally beneficial for large and small purchases. 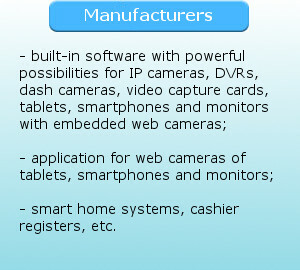 If you are a video surveillance equipment manufacturer (produce cameras, DVRs, tablets, dash cameras, video capture cards, tablets and monitors with embedded web cameras, smart home systems, etc. ), or if you sell it, our affiliate program with its special, most profitable conditions is just for you: special discounts for Xeoma licenses, and even free version to integrate to your devices. For cameras, embedded Xeoma Cloud can be used for storage and view. With Xeoma’s free rebranding, you will be able to offer Xeoma in your video surveillance project under any name of your choice, with modified design and information about your company. As you see, FelenaSoft offers very profitable affiliate program for resellers, integrators and Xeoma software distribution. Earn by helping clients save money with Xeoma dvr software! Affordable prices and powerful set of features of Xeoma will make your product more attractive for users than any of the competition! You can also offer Xeoma’s free version as a bonus to purchases. Got a question? Contact us! We will gladly advise on Xeoma integration into your projects with most benefits to you. No agreements or initial investments required. Any sum of purchases. Simply start selling Xeoma licenses and services to your clients and get your discounts, free licenses or commission money. The more you sell, the higher is your profit. Licenses can be bought for personal or commercial use (e.g. for reselling). Registration is only required for the MyCommerce method, but we would be delighted to meet you in any case! Come introduce yourself, and we’ll be able to recommend you to our clients! Contact us with any questions, to request an invoice, etc.! You can use this edition as main or alternative software with the cameras you produce or install. Xeoma’s free edition is much better than the regular bundled software, with 0 addition to cost! This version has the famous user-friendly modular-structure interface that users love so much, and modules and options of commercial Xeoma. View of up to 1000 cameras! When the user feels like buying and adding more cameras to expand the system, a license can be bought to unlock more features and more cameras. Works on Windows, Linux, Mac OS X, Android + iOS client coming soon. Online view via browser is available from any OS, any browser! Subscribe to our newsletter to get the free edition! With our free OEM/rebranding utility you can rebrand Xeoma security camera system into an application for Windows, Linux, Mac OS and Android with your name and sell it exclusively as your own in your country or region. Since the resulting product is unique you won’t need any agreement confirming your exclusive status. Just offer the rebranded Xeoma to your customers. Changing name will fully eliminate mentioning of Xeoma from the program so you can feel safe your clients will not buy licenses from us behind your back. They will only know and trust your company especially if they need camera and hardware installation, excellent local representation, quick response and very good/cheap prices for quality and one of the most powerful video surveillance software in the world. It’s more convenient for users to talk to a local company! Please note that we do not provide discounts to end-users so thanks to our beneficial discounts buying directly from you might be even cheaper for your clients! You will have the 100% of the market. 4 – License generation section. Please be advised that your reseller discount does not apply to Cloud and Repeater subscriptions! 6 – Enter name and email of your CLIENT. This data will be used to register license and will be shown in the program. Choose amount of such licenses you want to generate and click Order product. Generation takes only a second and generated licenses will be shown on screen. 8 – Show API button will show commands that can be used to integrate reseller area with your billing. You can contact us to get the invoice (for deposit please choose the Prepayment option) or pay the prepayment with a card (click the button below). Important: You are allowed to resell Xeoma security camera system to end users only at official Xeoma prices or higher. 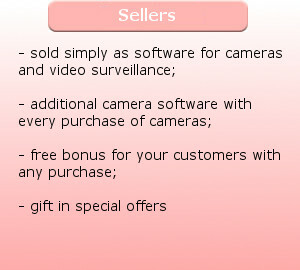 Resellers that received Xeoma security camera system licenses and subscriptions at lower prices or free of charge are prohibited to resell Xeoma to end-users at prices lower that the official retail price from our official site, including giving them free of charge, unless otherwise agreed upon with our company. For quick study of our product major advantages, download our 2-pages leaflet. Below is the technical datasheet for Xeoma (PDF format).